Ukraine manager Mykhailo Fomenko will continue to work with the national football team until the end of 2015. "The results of Mykhailo Fomenko's work with the national team in 2014 World Cup qualifying were recognized by the executive committee of the Football Federation of Ukraine as satisfactory, so the contract with the coach was automatically extended until the end of 2015," the FFU's press service reported. 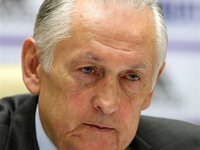 As reported, in December 2012, a contract with Fomenko was signed for one year with the possibility of automatic extension for two more years. The coach managed to change the situation in the 2014 World Cup qualifying tournament and almost brought the team to the world championship in Brazil, losing to France in the play-offs.